Alley 1 This is Alley one in the Grainger Market. At the southern end on Alley 1 you can find the fish market. The Grainger Market Arcade is distinguishable with its open space and domed glass roof. 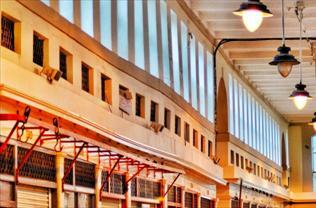 The Arcade part of the Grainger Market was originally built as the Vegetable Market, and once had two fountains in it! Over the years its undergone quite a few changes and refurbishments. Today its a busy part of the Grainger Market, and is also home to the Grainger Markets Events Space, and of course our own shop. The home of a huge variety of shops, this alleyway has a great mix of shops, including a butchers, takeaway food outlets, as well as everything from cards to CDs to fashion and fabric. Alley 3 The Grainger Market is full of surprises and alley three is no exception. The northern end of the alleyway is home to the world’s oldest and second smallest Marks & Spencer’s store. Called the ‘Penny Bazaar’ the stall has traded at this location within the Grainger Market for over 100 years. Read more about Marks & Spencer’s Grainger Market store in a blog post we’re writing soon. On alley two you can find the Market’s Weigh House. 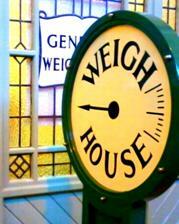 Although it’s usage has changed over the years, today you can still get weighed inside. The cost is 30p. Also in the Weigh House you can buy a Grainger Market bag for £2 and pick up a brochure about the Market. 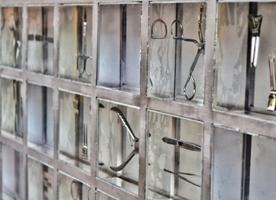 Take a look at this artwork by students of the university. You can find it in the entranceway to Alley One from Nelson Street. 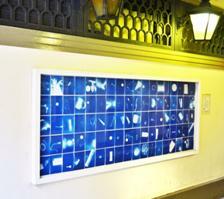 This artwork is next door to the hairdressers in the Grainger Arcade. It was designed in 2004 by Gilly Rogers and contains 75 items used for beauty and styling. Outside the entranceways on Clayton Street are these two memorial plaques. The one on the left is on the wall outside the Grainger Market. 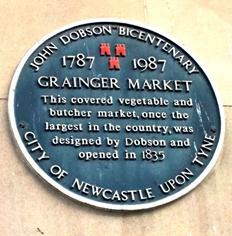 It commemorates John Dobson, who designed the original Market. The plaque on the right is built into the pavement on Clayton Street, again outside the Grainger Market. 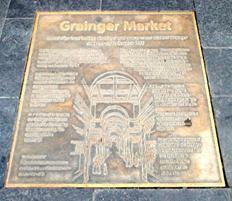 This plaque commemorates the 175th anniversary of the opening of the Grainger Market. All photographs taken by Karl Wilson.